In addition to the more traditional part regarding access to the railway infrastructure a new chapter has been added within the railway regulation since 2015, more specifically access to the service facilities and the services provided therein. A service facility is an installation, including a site, building or equipment, which is fully or partially equipped for the performance of one or more services as referred to in Appendix 1, points 2, 3 and 4 of the Railway Code (Law of 30 August 2013 regarding the Railway Code). Europe has further developed this domain in the Commission Implementing Regulation (EU) 2017/2177 of 22 November 2017 on access to service facilities and rail-related services with the aim of increasing transparency in the market for rail related services (RRS). This is primarily by requiring the operators of service facilities to publish information about the access conditions. In addition, the Implementing Regulation also lays down some rules that should ensure better cooperation between the operator of the service facility and the infrastructure managers, and for non-discriminatory treatment of railway undertakings. Any person who proves his or her interest can lodge an appeal with the Market Court in Brussels against any decision taken by the Regulatory Body in the context of his monitoring power and his authority regarding the handling of complaints. The appeal must be lodged within the period of one month from the notification of the decision or, for the interested persons to whom the decision did not have to be served, within a period of one month from the publication of the said decision in Belgian Gazette. The Market Court makes a decision with full jurisdiction. Decisions taken by the Regulatory Body in the context of its specific decision-making power can be challenged before the Council of State. Full monitoring of the market of service facilities is currently not yet available. 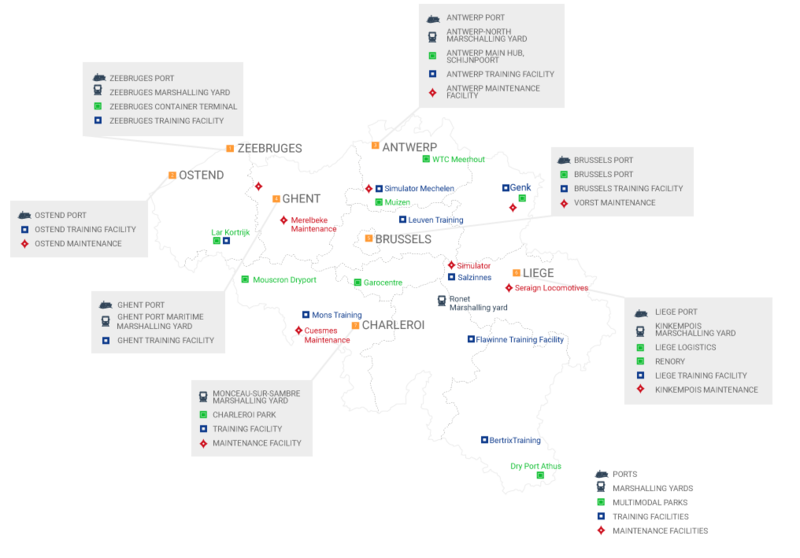 The map below gives a limited view of some of the facilities.